When Rabbi Goodman asked me to write and present a little glimpse into the life of the Rebbe’s wife, I had no idea that what I was doing was nothing less than discovering what Judaism means to me. I guess you could say that it is my Russian roots that has led me to stand and speak at the Chabad House and in some small way convey to my fellow students the incredibly self-sacrificing and influential life of Rebbetzin Chaya Muskha Schneerson. As a graduating college student who decided to live in the Chabad House in this, my senior year at Rutgers, one might think it incongruous that a college student could identify in any real way with as great and righteous a woman as the Rebbetzin, but I do. The research I did inspired me to give this small dedication to her on this, the day of her birthday – the 25th of Adar. 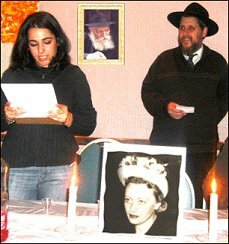 “Rebbetzin Chaya Mushka Schneerson (March 16, 1901- Feb 10, 1988) was referred to as the Rebbetzin. She was the wife of Rabbi Menachem Mendel Schneerson who was the 7th and last Rebbe of Chabad Lubavitch. She was born in Babinovitch, near the Russian city of Lubavitch. Throughout her childhood she had to move a lot from country to country because of the increasing dangers for the Jews. In 1928, she married Rabbi Menachem Mendel Schneerson in Warsaw and they moved to Berlin, Germany. After the Nazis controlled Germany they managed to flee to Brooklyn, NY where many Lubavitcher Chassidim already had settled. Rebbetzin Chaya Mushka was gracious and courteous to everyone. Throughout her life she repeatedly risked her life to help others under both Soviet and Nazi rule. She resisted efforts among the Lubavitchers to bestow public honors on her. She did not even like going to a store because all the people would give her a special Kavod (honor) for all her help and generosity, but she did not want that. She helped so many people with pride and grace but she did not want to hear thanks back. Right before her passing, she did not ask her doctor that was treating her, how she is doing, rather she was asking about his family and his daughters’ engagement. She always listened to everyone’s problems and showed concern and tried to help in any way she could. Many people listened to her advice and tried to do better and improved.